Well, Houston got a teeny tiny taste of the northern chill that is happening this winter. We were hit with freezing precipitation overnight and all schools were closed today. Rock-Paper-Scissors and I was the one staying home with the kids. I plan to make the most of it. A little work, a little playing with the kids and a little quilting. I got my fat 8th bundle of Little Black Dress 2 yesterday in the mail, so I was able to complete the center medallion of Reach for the Stars. I also added the first outer sashing strip. Right now it is 26″ square unfinished. I have to wait for my extra yardage from FQS to put on the second sashing – but no worries – I am now officially 6 blocks behind on this quilt. I have enough to work on while I’m waiting. My Quilters Newsletter magazine came in the mail yesterday also and it has the instructions for Blocks 4 – 5 – 6. When I say ‘instructions’, I mean that they put a picture of the block with the pieces labeled and the cut sizes of the pieces and that’s about it. There’s no measurements given for the sub-blocks as you go along, like I’m so used to with the FQS patterns (and a lot of patterns actually). That was a challenging part of completing the center because it was so large and a little complex with the side triangles and such. If you are making the quilt and have just started – I’m happy to share the sizes of any sub-blocks if you need them. Also, I wish I had thought before I cut when I went to make the HST for the outer ring. The instructions for cutting have you sewing the two smaller triangles together to make a single HST. 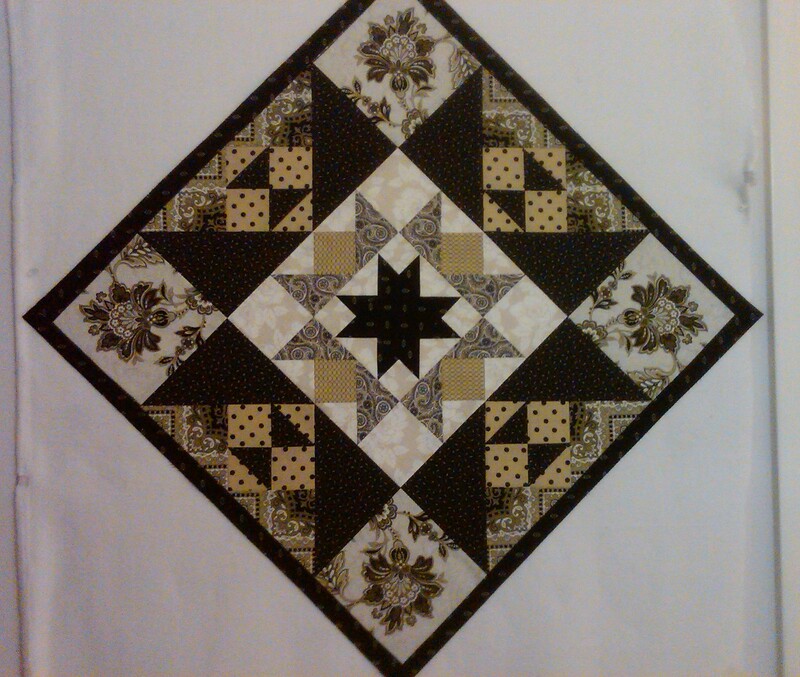 I should have used large squares and sewn them into two units – but it’s done now. I also wanted to share a picture of this project from Sherri Crisp, from Knoxville, TN. She’s quilting along too! So happy to have some other people to bounce ideas and pictures around with. 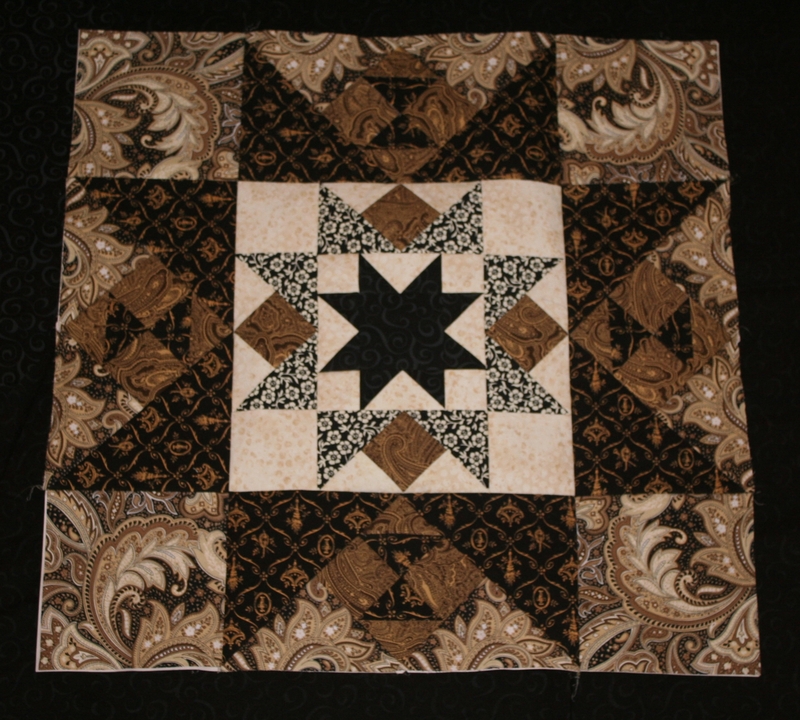 Sherri is doing hers with a fantastic rich brown paisley focus fabric and creams. She is also, so far, doing it by foundation paper piecing. I have never used this technique, but it is on my bucket list for this year. I can’t wait to see hers develop also. She doesn’t have a blog, but I asked her if I could share her pictures as we go along. Thanks Sherri! Stay warm and thanks for visiting today! ← New Year – New Project! Jennifer, your center medallion looks awesome. Look forward to seeing your progress with this one. I thought about doing it but have way to many other projects to do! Thanks for stopping by my blog! Both blocks are beautiful! Thanks for sharing your progress. Oh! I cannot believe how beautiful those two center medallions are! Such rich-looking fabrics and pleasing combinations. Magic! Jennifer, I also am working on Reach for the Stars with the same color pallet. I would love to stay in touch and learn and share the experience for this challenging quilt. I am in Houston, too and my name is Jennifer. What a coincident! Looking forward to seeing more of your beautiful blocks!